I don't know about you, but I'm a total sucker for case studies, recaps, and knowing exactly how a certain strategy is working out for another entrepreneur. Here's a screenshot from my ConvertKit email account. That tallest bar on the left is when I first announced the challenge to my email list, and then the second tallest bar on Jan.15 is the day prior to the challenge starting. Of course some of these challenge sign-ups were people already on my list. But take a look at my total numbers. I currently have 800 people on my list. Out of that total number, 656 of those came in during the last 30 days. Coincidence that my list exploded during the same time frame that I was running my challenge? Nope! One unexpected outcome was that all of my other email opt-ins that I have set up (I have several like a social media quiz, free tools download, Pinterest email course, etc.) gained more new list subscribers during the challenge than ever before. I'm guessing this is because my challenge content was being sharing more widely than my normal content, which resulted in more people exploring my website and social media accounts (which are optimized for opt-ins and list building). I emailed my current list about a week prior to the challenge starting, and then again the day before Day 1 to encourage sign-ups. I knew the challenge needed to be something specific that everyone opted-in for since it was going to include a daily email each of the 14 days (I wouldn't want to force myself into your inbox each day, unless you specifically opted in for that). I actually included a link at the bottom of each challenge email giving participants an option to opt-out of the daily emails (while staying on my general list), but only 2 people ended up choosing that option. I had 349 total people sign up for the challenge, with 24 people unsubscribing at some point, which gave me a final of 325 challenge subscribers by the end. Basically, if someone made it to my opt-in page, they were signing up! With an almost 97% conversion rate, only 11 people who saw the landing page, didn't opt-in. I made a point of making it easy for challenge participants to spread the word about the challenge. On the Thank You page after signing up for the challenge, I asked everyone to "invite your friends," and included a large button with a Click to Tweet already set up and ready to be shared. I also included strategic Click to Tweets throughout the challenge emails. On Day 1 of the challenge I had 210 participants, so during the course of the challenge, an additional 139 signed up. Most of my challenge emails were between a 50-65% open rate, which I was quite happy with. Leading up to the challenge start date, I posted a total of 7 Instagram photos that promoted the challenge in some way, whether that was a call to action in the caption, or a photo that was specifically branded with the challenge hashtag. My link in my Instagram bio was a direct link to the challenge sign-up page throughout the 14 days. During the challenge, I posted a branded Instagram photo with the day's Pinterest lesson topic on it. 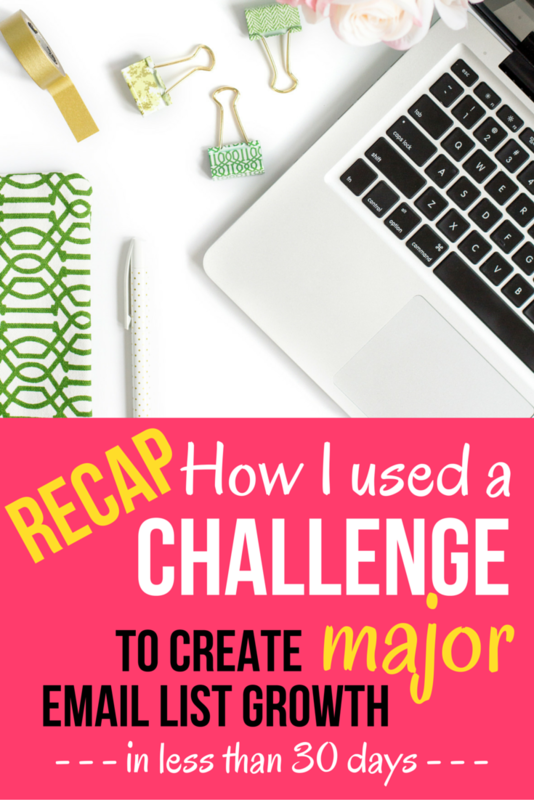 I had pre-written all of the captions, which were quite lengthy and were basically a condensed version of the challenge email lessons. (I had all my photos and captions saved on Dropbox so I could easily copy and paste them when ready to post). Most of the captions also included a call to action to sign up for the challenge by clicking the link in my profile. I created a Pinterest image to promote the challenge, and started pinning that to all of the group boards that I am a member of, about 1 week prior to the challenge. For each day of the challenge, I had a branded image for the day's lesson (similar to the Instagram photos), and posted that to all of my Pinterest group boards (I'm in 9 of them) on the appropriate day of the lesson. I used Tailwind to easily automate all of this Pinterest scheduling in advance, which saved me a lot of time! I also created my own Pinterest Board specifically for the challenge to hold all of the Challenge related Pins. I also had a branded Twitter image for each day's lesson. I normally pinned this image to my Twitter profile each day (so it stayed at the top), and then tweeted it out 2x each day. I also had general #PinProfitChallenge image tweets that I scheduled to go out several times per day all the way throughout the challenge. Well .... I failed on this one! I had planned to do a scope each day of the challenge to recap the day's lesson. I think I made it through the first 5 days. To get honest with you ... I currently have a 3 year old and 6 month old at home. There is no telling if or when nap time is going to happen each day. And by the time they had gone to bed at night, getting into "camera mode" became a bit draining. I LOVED running this challenge, and I didn't want one part of it to negatively impact my feelings towards it, so I made the decision to let the Periscope part go. Will I be on Periscope again in the future? Absolutely! Will I plan it out in a way that it requires me to be on each and every day at a certain time? Probably not. I created a free course site on Teachable, where I now have all of the lessons from the challenge hosted. I uploaded them on a daily basis to the course site, so that anyone in the challenge could access the lessons without searching through their emails. This also gave me a way to let people who signed up late for the challenge an easy was to get caught up, while keeping everyone on the same lesson email each day. Each challenge member was given login information for the Teachable course site in their welcome email. Out of the 349 that signed up for the challenge, a total of 125 people signed up to access the free course site. I created a Slack team group specifically for members of the challenge. A total of 74 of the challenge participants requested access, and then accepted an invite to the Slack team. I was in there daily providing feedback, answering questions, and sharing additional tips related to the day's lesson. This was a real highlight of the challenge for me! I felt like I really got to know the people in the Slack group on a much more personal basis, which was definitely a goal of mine for the challenge. Now here's the most exciting part of the challenge .... if you DID the work, then IT worked for you! On one of the final days of the challenge, I asked everyone who had participated to check their analytics. Yup, your Pinterest stats BLEW ME AWAY! So was setting up the challenge a lot of work? Yes. Was it worth it? 100% YES!